The word “resist” is everywhere these days. It’s usually used in a political context, such as in standing up against social subjection and authoritarianism. In the case of the Dutch band WITHIN TEMPTATION, it also extends to resisting continuing and ever more insidious intrusions into our personal privacy. Those themes are central to the band’s latest album, titled, yes, ‘Resist.’ Singer, songwriter, and concerned world citizen Sharon den Adel found herself increasingly troubled by recent world, and local, events. “It’s the world upside down in a few years’ time, that’s what I feel,” den Adel said in an interview backstage prior the band’s show with In Flames at The Fillmore in Philadelphia. She cited recent developments in Poland (whose government has passed increasingly more restrictive laws and has seen a rise in Islamophobia and xenophobia since being admitted to the European Union) and Hungary (which has cracked down on immigration and freedom of the press) as examples. Even in her own country, the Netherlands, certain changes have occurred. Worried about election hacking in 2017, the government announced all ballots cast would be counted by hand instead of electronically. “Nobody trusts them (computers) anymore,” den Adel said, “That’s just a sign of the time that we’re doing something wrong. “We (also) have a law that if you have a certain social background and also some indication that you have done criminal stuff in the past, it’s easier for (the government) to track you because you might be a risk in the future. “Where does it end? We’ve gone too far in trying to get a grip on certain problems we have in society. We are living in a democracy, but that can turn around at any time. You can see it in different countries – it used to be a democracy, and (then) one president, one party in power, and they change so many things,” she added. One song central to this theme is the one that kicks off the album, “The Reckoning.” With the trumpet-like keyboard riff that starts the track, it’s a clarion call to action and features Jacoby Shaddix of Papa Roach on vocals. “We had our history in the past, we had our wars, everyone in every country,” she said. “We fought for freedom in the Western world, and in most countries, we got it. I think through everything that’s happening with technology nowadays, small pieces are taken away from us. “We will always fight for freedom because we know what it is and we’ll never give it up,” she said. “Not that I’m saying call to arms, but it’s more like, if it comes down to it, that’s what will happen. “You already see it – you see it in Austria because there’s a right-wing party there. You see a lot of people waking up. They are trying to get laws through the government without the people standing behind (them). There’s a lot of tension there, like it is in Poland (and) in Hungary. We have (spent) a lot of EU money to get them started with their economy and now they’re closing their borders. It’s the world upside down at the moment,” she reiterated. “Endless War” has a double meaning — the idea of fighting endless wars in various countries as well as fighting endless personal wars within ourselves. “I’m always for dialogue – I’m not for real wars,” she said. “I’m a very peaceful person. But it’s does give me this anger about why don’t we ever learn. It makes me really sad. “I think maybe it’s also a realization getting older (she is 44). When you’re younger, you think you’re going to change the world. And then coming to a certain point in your life, you think, OK, now i’m older and the world didn’t get better,” she added. “Holy Ground” alludes to the sexual abuse scandal rocking the Catholic Church. “There’s certain things you don’t do,” she said. “It’s boundaries – that’s what I call the ‘holy ground.’ This is off-limits, this is ‘me’ space that you have to respect. “Some people just don’t and then when they don’t respect it, afterwards they’re denying that they even crossed it. And oh, that really gets me started,” she said with a wry laugh. Den Adel is also a mom – her children are 13, 9, and 7 – so these sociopolitical issues, along with technology and the loss of privacy, hit especially close to home. ‘Resist‘ also means resisting the inevitable calls to stay the same. Renowned for their symphonic sound laden with orchestral arrangements, this time around, WITHIN TEMPTATION looked to other sounds, like hip-hop and pop, for inspiration. There’s still plenty of symphonic touches – choral singing, the occasional strings, den Adel using the glorious operatic end of her voice – but those are used sparsely, as punctuation, not as the whole sentence. Together for over 20 years, the band is den Adel, her husband, Robert Westerholt (he writes a lot of the music, but stays home with the children during tours), guitarist Stefan Helleblad, lead guitarist Ruud Jolie, keyboardist Martijn Spierenburg, bassist Jeroen van Veen, and drummer Mike Coolen. “For us, it’s a very American album,” den Adel said. “And then everybody goes, no, it’s very European. What is typical European then? Because we left that orchestra out for (the most) part, which makes it very European. Keeping it more to guitars and those kinds of things, we thought it sounds more American. “In Europe, there’s always piano underneath or synthesizers. We did it on certain places, but a lot of times we also kept it out — it’s like let’s give more space to the music,” she added. 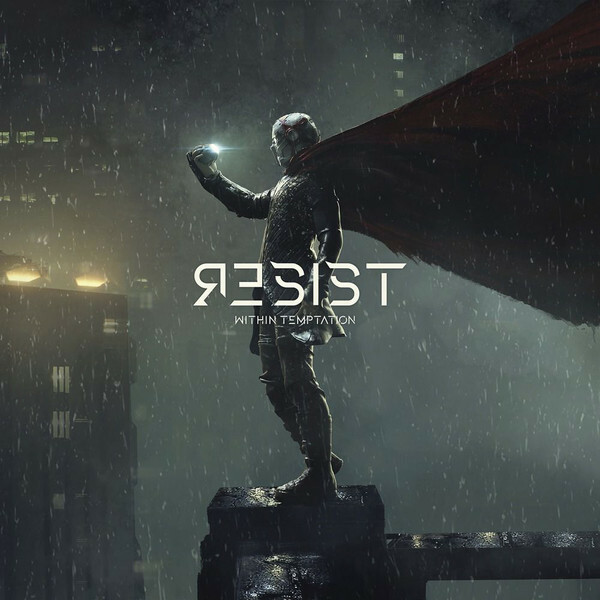 ‘Resist‘ was born from a very dark spot in WITHIN TEMPTATION’s timeline. A lengthy tour in support of their last album, ‘Hydra,’ coupled with the illness and subsequent passing of den Adel’s father at the end of that tour, along with wanting to change musically but not knowing exactly how, led to a case of writer’s block, the likes of which den Adel had not experienced before. “You can’t find the right words to express yourself any more – you feel it, but you can’t make that transition or the translation,” she said. “I had a lot of emotions, maybe too much, and they were all fighting to get attention. “I wasn’t even sure I wanted to go back to Within Temptation at the time because I just felt so emotional. I still couldn’t express myself. It was the heaviest period in a long time that I had,” she said. What started her on the path back to the band was, weirdly enough, another type of songwriting – in the form of her solo album, ‘My Indigo,’ released last April. A more intimate effort, more pop than anything else and heavily influenced by urban music, ‘My Indigo‘ gave WITHIN TEMPTATION a new lease on life. “I really wanted to experiment,” she said. “When I write for Within Temptation, it has to sound in big lines, a certain way, and I was like, I’m not going to do that, I can’t write that powerful kind of song, I really want to have something more introverted. “I tried a lot of new things and really had to figure out what kind of music I was actually making, because it just came out the way it came. (And) eventually we (the band) all sat together and it was like, OK, how are we going to continue with Within Temptation? And I said well, maybe we can use what I’ve learned from ‘My Indigo’ and see where it ends,” she added. The transition was surprisingly seamless. One track migrated from ‘My Indigo‘ to ‘Resist,’ the glorious “Firelight,” done with Belgian singer Jasper Steverlinck. It’s very reminiscent of Kate Bush, with a hypnotic vocal loop that acts almost like percussion, a powerful, bursting chorus, den Adel’s delicate soprano, and an appealingly jangly guitar solo. The soaring, poignant “Supernova” was written in memory of den Adel’s father. It’s about letting go of someone, of waiting for a divine sign that they have passed safely to the other side, and of continuing to long for their presence. “He was really hanging to life til the very last moment – he fought for every day – and that was such an inspirational time for me,” she said. “In the beginning, it was very difficult for him to accept he was sick, he was denying it, (and) I saw that as a weakness in a way. But eventually, my feelings about that changed, because I saw that’s the only way for him to continue to fight. They live one street away from where I live – I was there almost every day for three years. “My dad didn’t believe in an afterlife; he was never religious. But I’m more of a spiritual person. I’m hoping for him to give me a sign,” she added. The idea of resisting also carries over to categorization and labels, like the ever-present “female-fronted metal” tag, for instance. After all, no one calls other bands “male-fronted.” Or asks male singers how they balance business and family life. In the end, just maybe, “female-fronted” might be an entity unto itself. Ultimately, though, label WITHIN TEMPTATION by the music it offers, not the gender of its members.